Quick tips for usability testing right now! One of the main questions an organisation should be asking themselves is; “is my website successful?” In the modern world of digital marketing, it’s not enough to simply “have” a website, no matter how well-optimised its content is; if your audience find your website difficult to use – either practically or aesthetically – then they’re not going to click onto the relevant landing pages, and you’re not getting what you paid for. There is no specific “way” to test usability – no “tried and true” methods, and there certainly aren’t many “wrong” ways to go about it. It can be as easy as asking a friend, a relative or a neighbour – anybody who isn’t directly affiliated - to have a quick look at your website and tell you what they think. If you’d prefer to take a more scientific approach, implement webcams or video-capture software in order to see how a user might react, or where they might typically click. 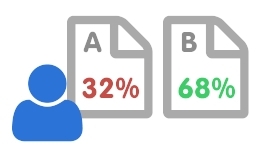 Prepare a few different “versions” of your pages with different colour schemes or layouts for the sake of A/B testing. Remember to prepare a script to deliver to your subjects to ensure a fair test, and record responses in order to calculate what your most common complaints are. Of course, Googling “usability testing” will bring back a vast array of firms who’ll be willing to perform very advanced tests for you, and testing usability can be as complex as implementing intricate technology that pin-points exactly where a user looks on your page – which, of course, is also great if you’re a slightly bigger business in charge of a larger number of webpages that simply can’t be managed on a basic level.